Files containing notes on deaths investigated by one of the first British forensic pathologists are due to go under the hammer at Sotheby's. Sir Bernard Spilsbury's index cards documented deaths in London and the Home Counties from 1905 to 1932. The hand-written cards, discovered in a lost cabinet, are expected to fetch up to £9,000 at the auction on 17 July. 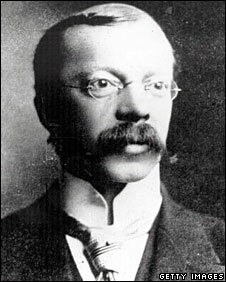 Sir Bernard came to prominence when his forensic evidence helped convict Dr Hawley Crippen who was later hanged. The index cards were found by a relative of the celebrated expert in a filing cabinet which was passed down through the family. Dr Gabriel Heaton, a manuscript specialist at Sotheby's, said: "Sir Bernard was the first person to really be working professionally as a forensic pathologist. "The files give an insight not only into the father of forensic pathology, but also into the social history of London at the time." The cards list that in January 1922 the expert looked into several cases including a suicide by cyanide in Hampstead, poisoning of a domestic servant and the murder of a 79-year-old woman who was battered to death. But some of Sir Bernard's findings are now being questioned based on new DNA evidence - the most famous being Dr Crippen's case who was convicted in 1910 of killing his wife. Dr Heaton said: "Sir Bernard was a very commanding figure in the witness box and was so highly respected that people didn't really question him as much as they should have done." Sir Bernard took his own life in 1947 at the age of 70 by gassing himself in his laboratory.